"Swing and a shot into the corner. It might make it! There it is: 62, folks! It just got over the left field wall in the corner. And we have a new home run champion! A new Sultan of Swat! It's Mark McGwire! He touches them all. Unbelievable." 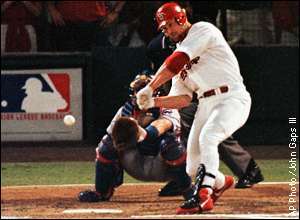 -The historic call of homer 62 by Cardinals radio broadcaster Mike Shannon.